They honored the late poet and her legacy at an event in Harlem. Bill and Hillary Clinton honor Maya Angelou at The Schomburg Center for Research in Black Culture in Harlem. President Bill Clinton and former Secretary of State Hillary Clinton were in Harlem, New York on Thursday to honor the legendary Dr. Maya Angelou days before the release of a new documentary on the late poet’s life and legacy. 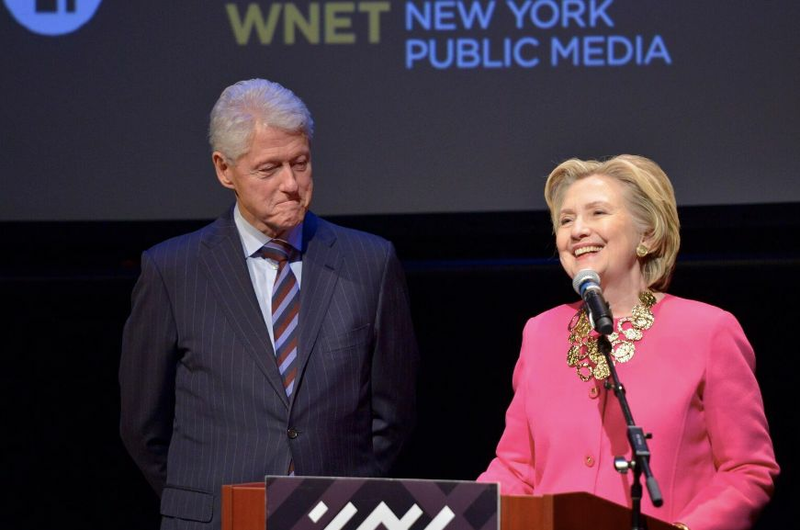 The Clintons spoke onstage at The Schomburg Center for Research in Black Culture, which was recently designated a national historic museum, at an event celebrating release of the documentary, “American Masters ― Maya Angelou: And Still I Rise.” The film, which debuts on PBS on Tuesday, delivers a remarkable inside look at who Angelou was as well as her impact and influence prior to and long after her May 2014 passing. The 71st Alfred E. Smith Memorial Foundation Dinner, held at the Waldorf Astoria, is an annual fundraiser benefiting Catholic Charities. It is sponsored by the foundation and hosted by the Archbishop of New York. This year’s host was Timothy Cardinal Dolan. Al Smith was a four-term New York governor and the first Catholic candidate for president. Every four years, this hot ticket dinner is the last venue for presidential candidates to share space, rub elbows with influential New York leaders, and exchange good-natured barbs. Candidates do not always attend, but this year – this very contentious year – they both did. Here are both speeches. Donald “won the coin toss” and spoke first. Many of his comments were downright bad hombre nasty. Only Hillary referred to Pope Francis. She retweets him often. @Pontifex. If you only want to see Hillary, this is her speech. Trump referred to the Cardinal’s “property” on 5th Avenue. My great-grandfather supplied the granite for St. Patrick’s from his Westchester quarry. Instead of poking fun at himself (the tradition) Trump poked fun at his wife for her purloined, plagiarized speech. Yes. That is Mary Higgins Clark. This is a HUGE Irish-American event. And, yes, Hillary very graciously greeted Melania Trump. Cardinal Dolan helped Hillary into her seat. Donald Trump helped himself into his seat and let his wife fend for herself. Whatta gent!!!! Hillary took most of Trump’s barbs with good humor. Some of them were pretty nasty from a bad hombre! The it was Hillary’s turn to speak. She was very funny. Alfred E. Smith IV is on the right. Great-grandson of the great Alfred E. Smith. After the Cardinal’s benediction, the event ended. The Trumps exited the Waldorf ASAP. Hillary had a lot of people she had to speak with. Chris Matthews and former police commish Ray Kelly. Henry Kissinger, who attends every year and is a major donor. Uncle Joe Biden would call this a big effing deal, and it is. It was. Heartfelt thanks to the Smith family and foundation for their wonderful work and to His Eminence, Cardinal Dolan, for hosting the candidates this crazy election year. Big KUDOS to Hillary for being so funny. Are you with Hillary? Let her know with a donation! After landing in White Plains from D.C. tonight, Hillary spoke to her traveling press about the explosions in New Jersey and New York. Here are some tweets from Dan Merica who was on board. Hillary Clinton was informed of the explosion in NY shortly after she left the stage at the CBC gala tonight, per an aide. After flying to NY, Clinton tells reporters she has been briefed on the "bombings in New York and New Jersey and the attack in Minnesota."